When I took this picture I had in mind that I'd use it for the weekend in black and white. I think I may prefer the color version so I'm including that for comparison sake. I'll go for the mono shot. personally i'm a color photo person and always would opt for the colored version 99.9% of the time. this is the 0.1%, i really like the b/w version. 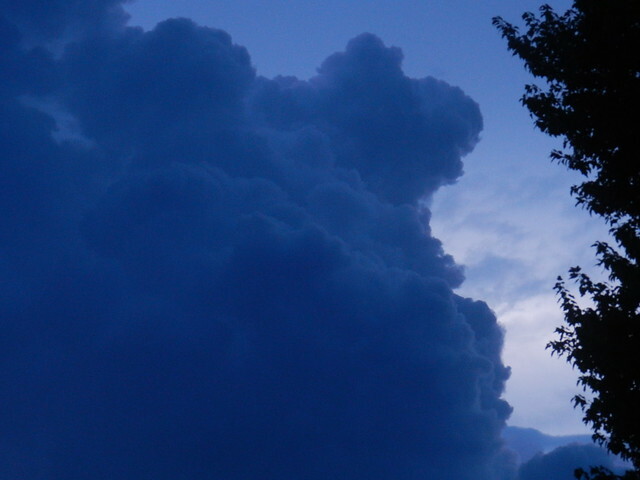 What a mighty cloud! I like both versions - and I also like your header photo. It's wonderful! I prefer the black and white - but you'd expect that, wouldn't you? A great dramatic cloud. I'll go for the mono, too! I think I go for the mono. That is an ominous looking cloud, especially in b&w which I like better. A Great roaring shot for BWW~ Happy Weekend to you! Either way, I'd be running for cover! Ominous, but beautiful. Definitely the black and white. Terrifying! The B&W shot looks scarier. What a dark cloud! I like the B&W version ... it´s wonderful! Looks like a great storm is brewing. I guess I'm the minority opinion--I like the color version better.